The Keratoconus & Scleral Lens Clinic at ReVision Optometry is directed by Brian Chou, OD, FAAO, FSLS, and is conveniently located in central San Diego. It is the local center of choice for more than 100 eye doctors that refer their keratoconus patients to Dr. Chou. Our clinic is just eight miles away from San Diego International Airport, making it easy for patients traveling from other states or internationally. While the average eye care practice may only see just one or two keratoconus a year, it’s not uncommon for half a dozen keratoconus patients to visit our clinic in a day. Dr. Chou was honored in 2017 by the National Keratoconus Foundation as their top optometrist in the U.S. His extensive experience in treating keratoconus includes publishing the first U.S. report on Intacs surgery for keratoconus during fellowship training at Jules Stein Eye Institute, UCLA School of Medicine. Subsequently, he served as an FDA clinical investigator of the first SynergEyes hybrid contact lenses for keratoconus. Dr. Chou has written book chapters and numerous articles on keratoconus. He has also presented continuing education courses to other eye doctors at national meetings on the clinical management of keratoconus. The Keratoconus & Scleral Lens Clinic at ReVision Optometry is equipped to manage keratoconus with advanced technology including corneal topography, optical coherence tomography (OCT), and multiple diagnostic contact lens set to accommodate even the most severe forms of the disease. The ReVision Optometry staff is familiar with the nuances of submitting necessary contact lens authorizations for keratoconus to Vision Service Plan and EyeMed Vision Care. Keratoconus is an eye disease in which the cornea, or the clear front dome of the eye, takes on a distorted shape. 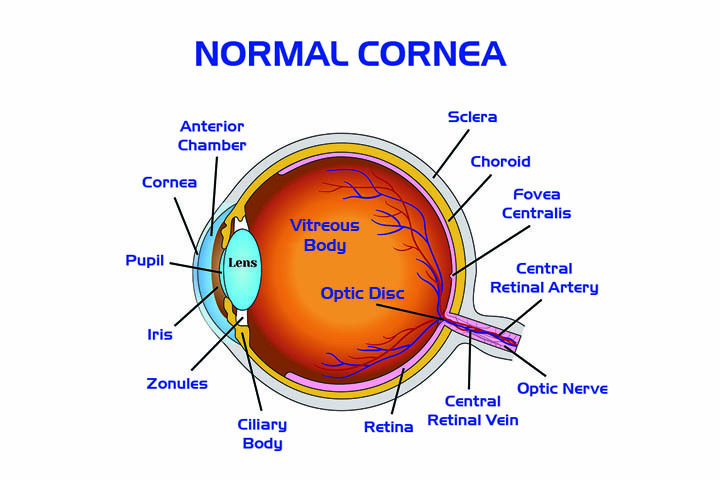 Light passing through the distorted cornea into the eye becomes highly aberrated, causing blurred vision, multiple images, and poor night vision. Eyeglasses or disposable soft contact lenses are often ineffective at restoring good vision, while LASIK eye surgery is not safe because the cornea in keratoconus is too thin and weak. The latest research shows that keratoconus has a genetic link and it may affect as many as 1 in 375 individuals. Although keratoconus usually begins during the teenage years and progresses into the twenties and thirties before stabilizing on its own, it often is not correctly diagnosed until later in life. As an uncommon eye condition, eye doctors do not always suspect keratoconus and look for it. 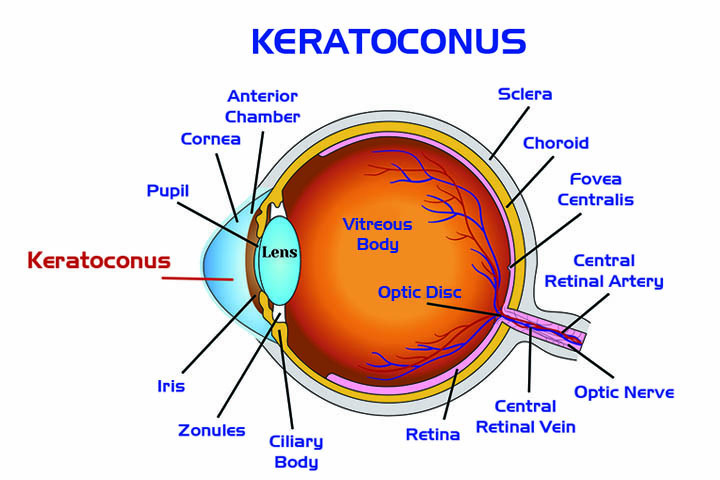 Additionally, some forms of keratoconus are so subtle that advanced diagnostic technology to detect its presence. If keratoconus is detected during adolescence at its earliest stage, corneal cross-linking surgery can slow or halt the progression of the disease to minimize deterioration of vision. While corneal cross-linking is directed toward prevention of vision loss, special rigid surface contact lenses are needed to restore vision to a functional level. Certain eye doctors have the expertise and experience to prescribe these contact lenses which are not cosmetic but deemed by vision benefit plans as “medically necessary.” Rigid surface contact lenses create a smooth artificial light bending surface, covering up the distorted natural cornea in keratoconus. Although vision rehabilitation with conventional rigid gas permeable contact lenses is straightforward, sustainable wear is commonly more elusive. Regular rigid lens wear is frequently undermined by the instability of the lens on the eye, irritating dust particles getting underneath, and general discomfort related to lens wear. Fortunately, new contact lens technologies – including scleral contact lenses and SynergEyes hybrid contact lenses – have made it possible for certain eye doctors to remedy the common shortcomings of conventional rigid contact lenses. Scleral contact lenses are rigid surface medical devices the size of a nickel to a quarter, designed to rest on the tough outer white coat, or sclera, of the human eye. When appropriately prescribed, they not only provide rigid-quality vision, but they usually offer the wearing comfort close to a soft disposable contact lens. Due to their relatively large diameter, they are stable on the eye and do not dislodge nor eject, even in extreme fields of gaze. This makes them ideal for sports and aquatic activities, along with general activities of daily living. Scleral lenses also trap moisture against the sensitive cornea making them an effective treatment for extreme dry eye disease, including Sjögren’s syndrome and graft-versus-host disease (GVHD). Scleral lenses are most commonly prescribed for patients with an irregular cornea, where the surface of the eye is not smooth – whether keratoconus, poor outcomes after radial keratotomy and LASIK, previous corneal infection or trauma, or after corneal transplantation. Dr. Chou has prescribed scleral contact lenses since 2008 when many eye doctors were aware of these lenses. He is a consultant to several scleral lens manufacturers, trains other doctors on prescribing these lenses, and even helped develop a scleral lens to see underwater. Dr. Chou is the first eye doctor in San Diego County to earn Fellowship in the Scleral Lens Education Society.